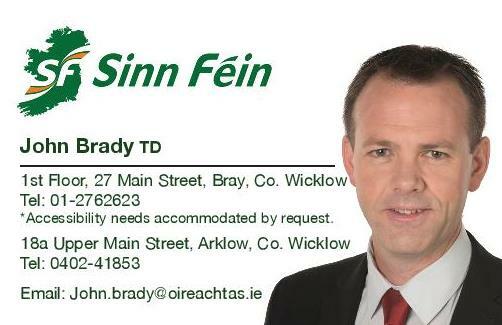 Sinn Féin spokesperson for Employment Affairs & Social Protection John Brady has today published proposals for the establishment of a Child Maintenance Service. “I have just launched Sinn Féin’s proposals on the establishment of a Child Maintenance Service (CMS) based on the successful model in place in the North of Ireland. “This will be a free service available to lone parents and will assist them in a range of different ways from providing basic information and advice, to calculating maintenance, collecting maintenance payments and transferring payments to the lone parent. “The three options available under this service are Parental Arrangements, Direct Pay, and Collect & Transfer. “Under Parental Arrangements, lone parents can access advice and assistance from the CMS in cases where they are able to come to an arrangement with the non-custodial parent. “Under Direct Pay, the CMS will step in where the non-custodial parent is happy to pay maintenance but an agreement on the amount cannot be reached. “Finally, Collect & Transfer will be enforced where maintenance payments cease to be paid to the lone parent whether that is under Parental Arrangements or the Direct Pay option. 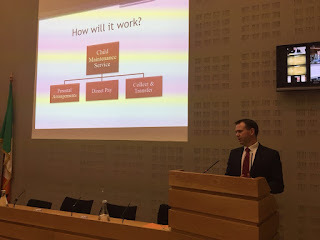 "This will be the automatic option put in place in cases of domestic abuse ensuring that at no stage will the lone parent have to contact their ex-partner. “The service will have considerable enforcement powers available to them. This will allow them to pursue maintenance payments in cases where they have to. "This is particularly important if we are to avoid the non-compliance experienced in Britain. Enforcement powers will include the ability to deduct maintenance from income or social welfare payments, the use of bailiffs to collect arrears or seize payments and as a last resort conviction. “For far too long, lone parents have been left to seek child maintenance payments from an ex-partner with no support or guidance from the State. It is time to end this practice. It is time to use child maintenance as one means of lifting children in lone parent families out of poverty.